In every few months Microsoft releases some big Windows update. And, as you know, Microsoft does not provide any option to disable auto update. Recently, after updating Windows many users started facing an unknown problem. Unknown because no error code appears. Just, Windows 10 black screen with cursor. For some users black screen goes after few minutes. And, for some users black screen doesn’t get vanish. If you’re facing similar issue after update. Or, windows 10 screen goes black randomly. Then, try solutions mentioned in this article. And, hopefully problem will get resolved. I was facing same issue after Windows 10 version 1809 update. And, I had fix this problem. Why “Windows 10 black screen” appears?. Windows black screen could be due to software or hardware issue. If black screen appear after login, then it’s software problem. Maybe due to incomplete Windows update. Or, due to some installed third party software. To boot up Windows, there are some background process, that needs to run. But, if any third party software tries to start at startup. Then, Windows shows black screen. 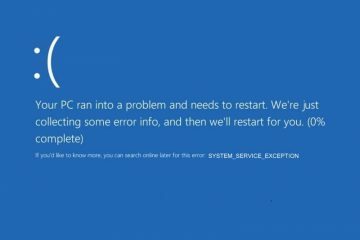 If Windows 10 Black Screen With Cursor appear randomly or before login screen. Then, it might me a hardware issue. In most cases, faulty graphics card could be behind this problem. 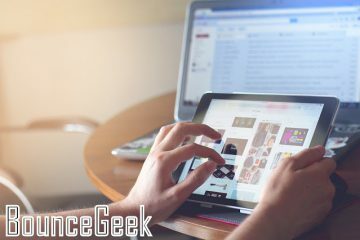 If apart from Intel’s on board graphics card your Computer or laptop have dedicated graphics card. Then, this problem occur due to outdated driver software. So, Overall, there isn’t any specific reason behind this Windows 10 black screen problem. For every users problem occur at different point. That’s why, In this article, I am adding all possible solution related to this problem. 1 Fix Windows 10 Black Screen With Cursor. 1.1 1. Wait for the installation to get Complete. 1.2 2. Remove all connected peripheral. 1.3 3. Check VGA Cable. 1.4 4. Wake up the display. 1.5 5. Use secondary monitor or display. 1.6 6. Fix User Shell using Registry Editor. 1.7 7. Go back to the previous version. 1.8 8. Run SFC and DISM Scan. 1.9 Start Windows in Safe Mode. 1.10 9. Turn Off Fast Startup. 1.11 10. Disable Onboard Graphics Card Driver. 1.12 11. Uninstall Problematic Software. 1.13 Conclusion : Windows 10 Black Screen With Cursor. Fix Windows 10 Black Screen With Cursor. 1. Wait for the installation to get Complete. With Quality, Definition updates Microsoft also does provides driver update. It could possible that, Windows is installing graphics driver in background. So, you have to wait at-least 10-15 minutes to process to get complete. For some users at the top left corner “Installation in process” message also appears. But, it could possible that driver installation, got stuck at some point. So, if even after half hour, nothing appear on screen except mouse cursor. Then, you have to force shut down your laptop or Computer. By holding down power key for 10 seconds. 2. Remove all connected peripheral. It could also possible that, due to some devices “Windows 10 Black Screen With Cursor” problem occurring. 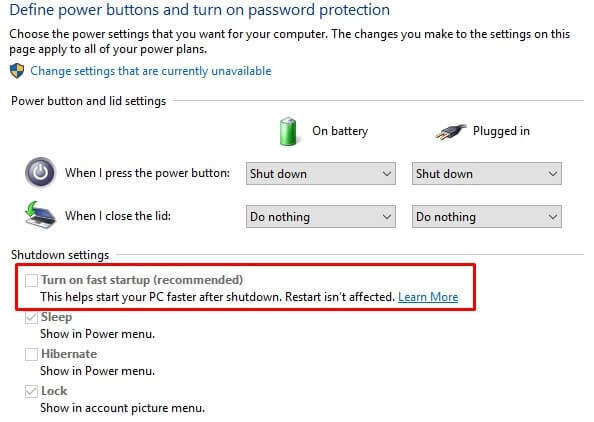 So, First shut down your Computer or Laptop Completely. And, then, remove all non-essential peripheral including printer, external HDD, secondary monitor and Ethernet cable. If you’re using laptop, then, I suggest you to remove battery also. After a minute of removing battery. Plug laptop battery and then connect power cable. Now, turn on laptop or Computer, and, hopefully, problem will get resolved. 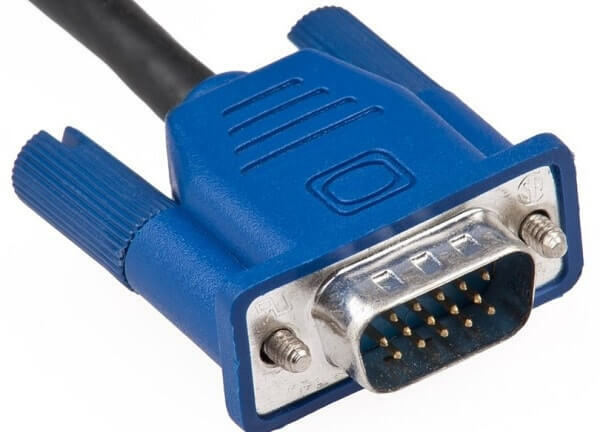 VGA (Video Graphics Array) Cable is used in desktop Computer to connect monitor with the CPU. It helps to transfer video signals. So, if Windows 10 black screen with cursor appear randomly. Then, undoubtedly it’s because of the loose connection. Or, maybe VGA Cable or port got faulty. So, First turn off the Computer. And, remove power cable from board. Turn on Computer. And, if problem was with VGA cable, then it will get resolved. 4. Wake up the display. If Windows 10 is unable to detect the display. Then, also black screen appear in Windows 10. Though, with simple key combination you can wake up your Computer Display. 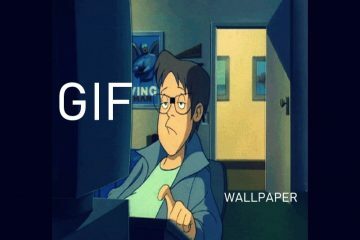 To wake the display Press Windows + Ctrl + Shift + B simultaneously. 5. Use secondary monitor or display. If black screen appearing randomly. Then, maybe, something is wrong with the display. 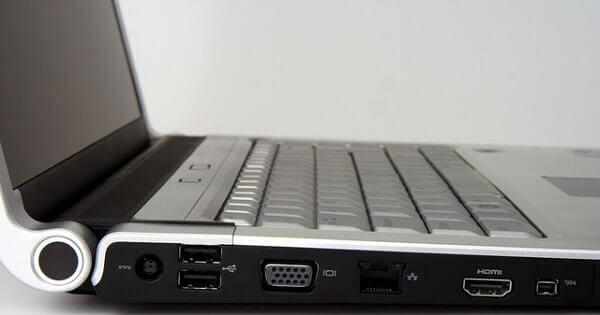 If you’re using laptop, then maybe loose port is the real issue. So, to find out that problem is with laptop or computer display or not. You can connect secondary monitor using VGA Cable or HDMI Cable. If your laptop doesn’t have VGA port but your monitor comes with VGA cable. Then, you can use “HDMI to VGA Adapter”. It cost you less than 5 USD. After connected secondary monitor or display. You need to press Windows + P key simultaneously to open easy display switcher. Here you will find out four option, which you can select by using arrow key. I suggest you to try one by one option. Or, you can use “second screen only” option. It will disable your main screen. And, will project on secondary monitor. 6. Fix User Shell using Registry Editor. This is the best solution for those who got Windows 10 black screen with cursor problem after login. I found this solution on a Windows Forum. And, many users was able to fix this problem with this solution. So, you can give it a try. In this solution, we are making sure that. Windows should open explorer after login. The main reason behind black screen issue is user shell is corrupted. 1. Press Ctrl + Alt + Delete key simultaneously. 2. A screen will appear with some options, click on “Task Manager”. 3. In Task Manager, Go to File Menu, click on “run new task”. 4. Now in ‘create new task’ window, type regedit. Then, mark “create this task with administrative privileges” and click on OK.
5. In Registry Editor Go to HKEY_LOCAL_MACHINE > Software > Microsoft > Windows NT > Current Version > Click on Winlogon. 6. After clicking on Winlogon, you will able to see certain registry in Right-Side. 7. Double click on shell. 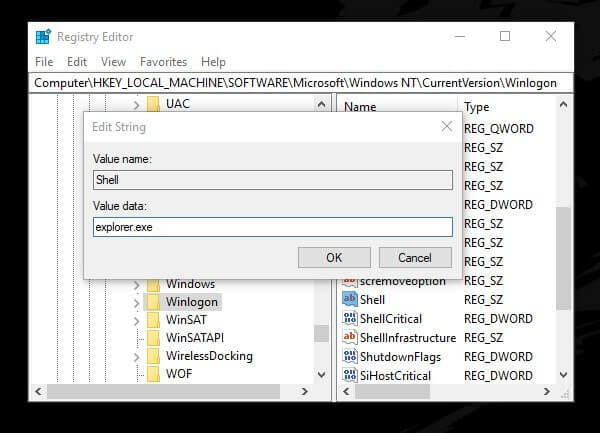 And then edit string window, type “explorer.exe” in Value data field. And, then click on OK to save changes. 8. Now, close Registry editor. Again, press Ctrl + Alt + Delete key. 9. At the bottom right corner you will able to see power icon. Click on it, and then click on ‘restart’ or ‘update and restart’. That’s it. now hopefully problem will get resolved after restart. Note: Registry Editor aren’t for a normal Windows user. If you make some unwanted changes in it. Then, you will end up facing more errors and Windows issues. 7. Go back to the previous version. If, Windows OS was working fine before. And, Windows 10 Black Screen With Cursor problem occur after update. Then, the best solution is go back to the previous version. Means, this option will uninstall all latest installed update. And, if update was the issue, then after going back into the previous version of Windows. Your problem will get resolved. 1. First, force shut down your Computer by holding down the power key. 2. After 10 seconds, turn on Computer and don’t login. Stay on login screen. 3. In Windows 10 login screen, you will able to see power icon in bottom right corner. 4. A screen will appear, Click on Troubleshoot > Advanced Options. 5. In Advanced options, click on “Go back to the previous version”. 6. Within 30 seconds, Windows will ask you for the account details. To verify the owner. You just have to click on your Windows Admin Account and enter password. Go back to previous version, process takes time. (depends on update size.) So, stay connected with power adapter, if using laptop. And, don’t try to force shut down Computer between process. When process will get complete, normal login window will get open. And, hopefully this problem will not occur again. Although, Windows does install updates automatically. So, it could possible that Windows install same update in background. And, you might face same problem again. So, you can either stop auto update in Windows 10. Or, can install latest version of Windows using bootable media. 8. Run SFC and DISM Scan. If you haven’t installed any update recently. But, still black screen windows 10 problem is occurring. Then, maybe some system files, got corrupted. So, I suggest you to run system file checker and Deployment Image Servicing and Management tool. Both tools will help you to replace corrupted system files. With the cache copy of Windows. 1. Press Ctrl + Alt + Delete. Click on Task Manager from options. 2. Go to file > run new task, in task manager. 3. In create new task window, type CMD and then mark “create this task with administrative privileges”. 4. Command Prompt window will get open. Give the following command and press enter for SFC Scan. After Completing SFC Scan, restart Computer. (By using Ctrl + Alt + Delete menu options.) And, if after Windows 10 black screen with cursor, problem still not got solved. Then, open CMD using same process, and then run the following command for DISM tool. Run both these commands one after one. Press enter after giving each command. 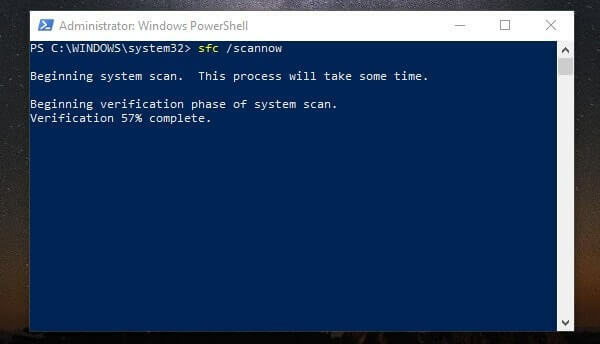 After completing DISM scan, restart your Computer. And, hopefully black screen Windows problem will get resolved. 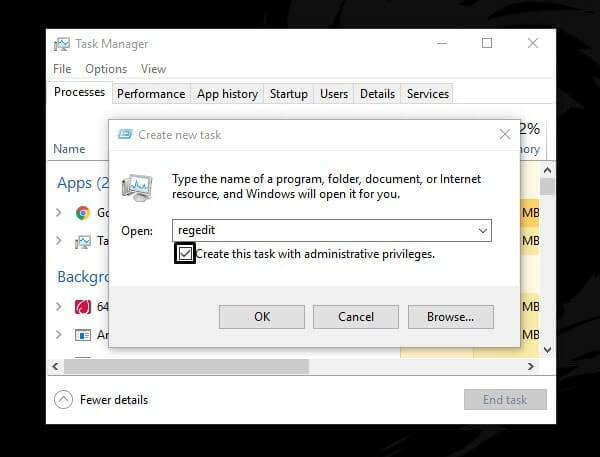 If you’re unable to open task manager. Then, you have to boot Windows into safe mode. Also, to try out next solutions, safe mode will be helpful. Safe Mode is basically a diagnose mode of the Computer. Safe mode only allows essentials Window program and required services to start up at boot. And, in safe mode you will not face black screen Windows 10 problem. So, you can fix this problem from safe mode. 1. Enter into Advanced Options, by following four steps of solution number 7. 2. In Advanced options, go to Startup Settings > Restart. 3. After Windows restart, you will able to see list of options. 4. Select 5, or press F5 to enter into safe mode with networking option. 9. Turn Off Fast Startup. Fast Startup in Windows 10, provides a faster boot time when starting PC. But, sometimes it causes some problems.  Like Windows 10 black screen with cursor. So, you can try disabling fast startup. But, if problem doesn’t get resolved. Then, I suggest you to turn on fast startup again. 1. In safe mode, open control panel. 2. Click on hardware and sound > power options. 3. Click on “Choose what the power button does” from left pane. 4. After that, Click on “Change settings that are currently unavailable” option. 5. Now, just unmark “Turn on fast startup” option. Click on “save changes”. And, shut down your Computer to exit from safe mode. 10. Disable Onboard Graphics Card Driver. If your Computer have two graphics card. Means, Onboard Intel graphics card and a dedicated graphics card. 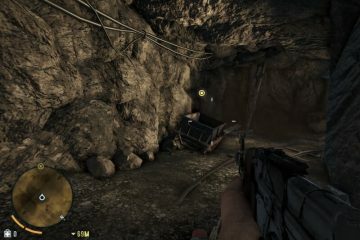 Then, you can disable Onboard graphics card driver temporarily. 1. In safe mode, press Windows + R key. In run window type devmgmt.msc and press enter. 2. Device manager will get open, expand “Display adapters” section. 3. 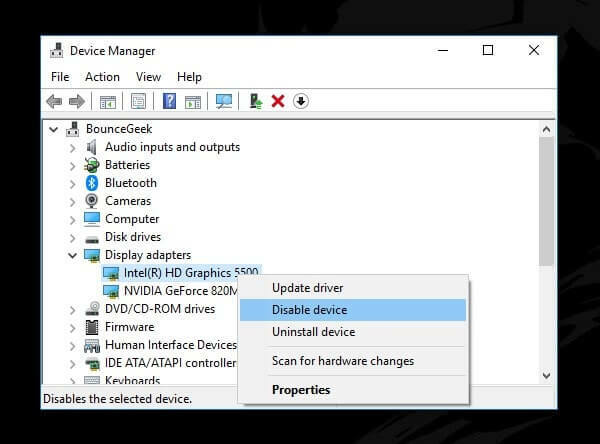 Right-Click on your Onboard Graphics Card, and then click on Disable Device. That’s it. Now exit from safe mode. 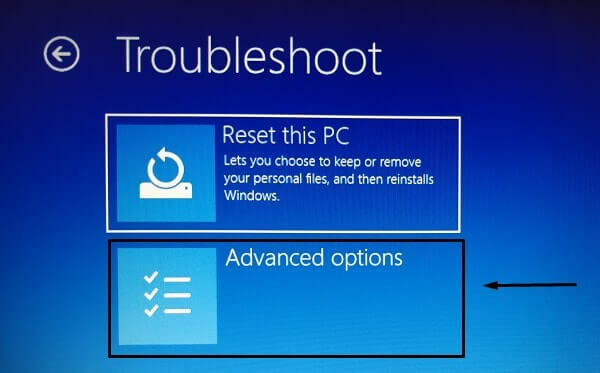 Hopefully Windows 10 Black Screen With Cursor problem will get resolved. If not then I suggest you to re-enable Onboard graphics card. You can also try to enable or disable dedicated Graphics card using same method. It could possible that, due to some recently installed third party software. This “Windows 10 black Black Screen with Cursor” problem is occuring. So, I suggest you to uninstall all unwanted Windows program. 2. In run window, type appwiz.cpl and press enter. 3. Now, from here you can uninstall or change any program. Conclusion : Windows 10 Black Screen With Cursor. 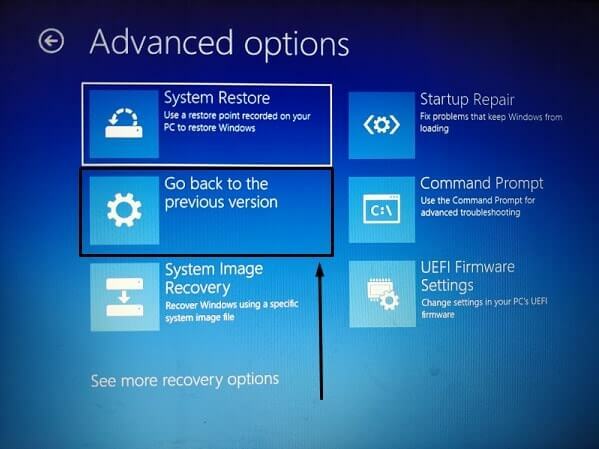 So, these are the solutions to fix windows 10 boots to black screen with cursor. Though, most users have solved this problem with solution number 6 and 7. If after trying all solution problem doesn’t get solved. Then, create a bootable media of latest version of Windows. 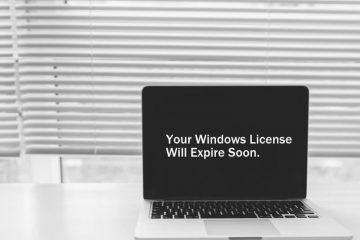 And, perform a clean installation of Windows 10. Although, update was the reason behind this problem then you don’t need to reinstall Windows. Because, These solutions are enough to fix this problem.